In 1983, cultural historian Warren Susman wrote a brief but remarkably suggestive essay in the journal Chicago History. The essay, “Ritual Fairs,” evoked the categories of ritual studies and the sociology of religion to understand the significance of World’s Fairs to American culture. Like the medieval fairs, World’s Fairs were “idealized towns, utopias, or as H. Bruce Franklin shrewdly suggests about New York’s 1939 fair, works of science fiction.” Consequently, Susman recommends that we understand the fairs in light of the liminal stage that Victory Turner assigned to pilgrimages. The fairs separated the “pilgrim” from their ordinary world and immersed them in another world “somewhere between past, present, and future.” From this vantage point fair goers were led to “an acceptance and participation in a new social order that is emerging technologically, socially, culturally, politically”. 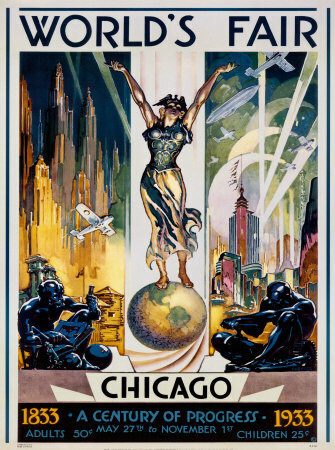 Consider the poster below, from the 1933 Century of Progress Fair in Chicago, a graphic representation of this idea of liminality. The fair’s icon stands posed between the world as it has been and the imagined world of the future. Borrowing from Emile Durkheim’s notion that religion involves the worship of society, Susman also believes that the fair goers “went to worship or at least stayed to worship a vision of that society or social order.” Susman doesn’t use this language, but it is an eschatological vision that the fairs communicated and invited attendees to worship and participate in. It was not a vision of society as it was or had been, but as it could be. In this respect, the fairs traded in the cultivation of hope; thus their frequent appearance at times of economic or social upheaval. To wrap up with a question, is there anything comparable today? Do we have anything that serves a similar function in what is evidently our ongoing transition from one form of society to another?